My past experience with the college reunions of friends and relatives included marching bands, brightly-colored seersucker, and the revival of retro kegger culture. The Bard College Berlin alumni event, which took place this past December 11th of 2016, was tame in comparison, infused with the muted but eccentric quality of BCB itself. Student art from the Open Studios event still decorated the walls of the Factory. Former students greeted each other with inside jokes and embraces; professors and faculty also filled the small room. A pile of black, mid-length coats were stacked in the waiting room in classic BCB fashion (some things, like style choices, apparently don’t change after graduation). The evening was a break from the regularly scheduled alumni programming — typically, the alumni have an annual get-together on campus around Commencement. However, this special event was organized to encourage further contact and strengthen the alumni network. The evening began with presentations regarding the state of affairs at BCB followed by an open discussion and the opportunity to socialize, reconnect, and attend a representation of Aristophanes’ The Clouds staged by alumna Maria Khan. Dean Catherine Toal began the evening with a review of recent curricular developments at BCB, which she summarized with references to three texts relating to the arts, core, and politics courses. In the last volume of Proust’s À la recherche du temps perdu, the narrator emphasizes the importance of discovering our “real life” as the sum of many experiences in order to create art. The growth of the arts at BCB is designed to encourage the process of finding an authentic voice. Professor Toal noted that the core curriculum had been preserved and extended. Its spirit can be evoked by one of the works that inspired it, Hans Blumenberg’s Die Legitimität der Neuzeit. In contrast to negative accounts of modernity, Blumenberg’s analysis of the relationship between ancient, medieval and modern intellectual history describes the problem-solving struggle as one of human self-assertion and creativity. In an overview of additions to the politics curriculum, Toal cited an article on the same topic as a recent course at BCB – a topic with regard to which there is continual wrangling over definitions: “populism.” In the taz newspaper of December 12, Joseph Vogl and Ethel Matala de Mazza argue against linking populism with specific parties or movements – it is a coalition of ressentiment that can form across any political grouping. Their claim shows the importance of combining the study of politics with engagement in social action. These three texts contain guiding sentiments regarding the BCB curriculum, which is constantly evolving. The next speaker was Susan Gillespie, Founding Director of the Institute for International Liberal Education at Bard College. Gillespie described how the centrality of the Berlin location in the Bard network has benefited the network as a whole. The evening continued with further exploration of the role alumni ought to play as a former part of an expanding university. There were suggestions for alumni networks, a mailing list to organize meet-ups for current Berlin events, and the creation of a core alumni group in Berlin. Many alumni and faculty also backed the proposal for a mentorship program to strengthen the connections between graduates — particularly those based in Berlin — and current students. Through such a program, current students would gain the opportunity to learn about the careers of graduates, establish professional networks, and solidify internship opportunities. Later in the evening, an old alumni network proposal from about five years ago resurfaced. 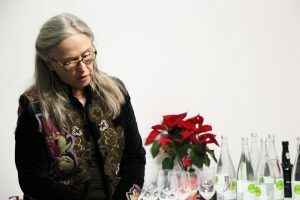 The speaker noted that, while reflecting over the suggestions to stay in touch with other alumni, he felt a sense of longing for the unique removal from the ‘real world’ that was captured at his time at Bard College Berlin (then ECLA). He proposed that the alumni community be made more into a “club” so that the informal social interaction characteristic of the university experience could continue beyond graduation. Rumors of an ‘undercover’ alumni reading group of Plato’s Republic circulated, only to be later confirmed by a professor… who invited anyone from the audience to join and clarified that the group was not actually very undercover at all. From an artist’s studio walls to an ‘unofficial’ Plato reading group, the alumni event revealed that many former students were still reconciling their student experience with their day-to-day existence in the so-called ‘real’ world. In difficult professional climates, the collective attitude indicated the invaluable nature of a haven for academia, no matter one’s future career path. Those who attended the meeting decided to continue the conversation about the alumni network at future gatherings.